Yes, the undisputed champion and first inspiration for many a hopeful ecdysiast is bringing her star-studded Strip Strip Hooray! Variety show to Seattle. West Coast tour dates were announced on Monday and include two nights at The Neptune (Seattle) and two at the Aladdin Theater (Portland). At this point, tickets are only available on presale for Seattle, and the password is ELECTRONIC. Click HERE for Seattle presale, and HERE to see the rest of the tour dates. STG presents Dita Von Teese Burlesque at the Neptune Theatre in Seattle on Thursday & Friday, May 24th & 25th, 2012. She is the biggest name in burlesque since Gypsy Rose Lee. She is a modern day fashion icon who tops best- dressed lists all over the world. She is credited for bringing back the glamour and allure of Old Hollywood stars. Self-created. Distinctive. Iconic. Often imitated, never duplicated. She is Dita Von Teese. Born Heather Sweet in West Branch, Michigan, Dita grew up fascinated by the Golden Age of Cinema, pin-up imagery, and vintage lingerie. This naturally blond, mid-western girl then transformed herself into one of the glamour girls she grew up adoring. Performing burlesque since 1992, she is the undisputed international queen of burlesque, and credited with bringing the art form back in to the spotlight with a new sense of glamour and sophistication. Taking audiences on a journey into fantasy and spectacle, Dita is renowned for her ornate sets and dazzling haute-couture performance costumes adorned with hundreds of thousands of Swarovski crystals. This “Burlesque Superheroine” (Vanity Fair) determines every aspect of her burlesque shows from the set and costume, to the music and lighting. Best known for her cocktail glass show in which she performs a classic style striptease that culminates with her bathing in a glass, Dita recreated this iconic show for her role as the global ambassador for Cointreau. Her “Be Cointreauversial,” show is a grander version of her famous cocktail glass show which she has performed in Tokyo, Sydney, New York, London, Paris, Sao Paulo and Los Angeles. She also just developed her 2nd Cointreau cocktail, the MargaDITA, inspired by the original Cointreau Margarita, and launched the Cointreau Prive pop-up bar in London. A self-styled fashion icon that has topped several international best dressed lists and walked in various high profile fashion-shows, Dita is bringing some of her signature style to the masses this Fall. Her first fragrance, “Dita Von Teese” launched in October and is currently available in Germany/Austria/Switzerland with plans for expansion into the UK, US, Canada, and Australia slated for early 2012. Her lingerie collection, “Von Follies by Dita Von Teese” is launching exclusively at Target Australia in March 2012 with expansion to the UK and US later in the year. In addition, Dita is launching her first dress capsule collection exclusively at David Jones in Australia in January 2012, with global expansion to follow. “Dita Von Teese MUSE” features 4 dresses and 1 coat, all based on some of her personal vintage treasures. A high-end lingerie collection and cosmetics collection will follow in 2012 as well. An advocate in the fight against HIV and AIDS, Dita was a MAC Viva Glam Spokesperson from 2006-2008 and in 2009 she participated in the H&M/Fashion Against Aids campaign. She has also performed and appeared at several events for Amfar and was honored with their Award of Courage in 2008. Her status as a burlesque star and modern-day feminist has also garnered her an invitation to speak at the Oxford Student Union, where other elected speakers have included the Dalai Lama, Mother Teresa, Tony Blair, and Anna Wintour. 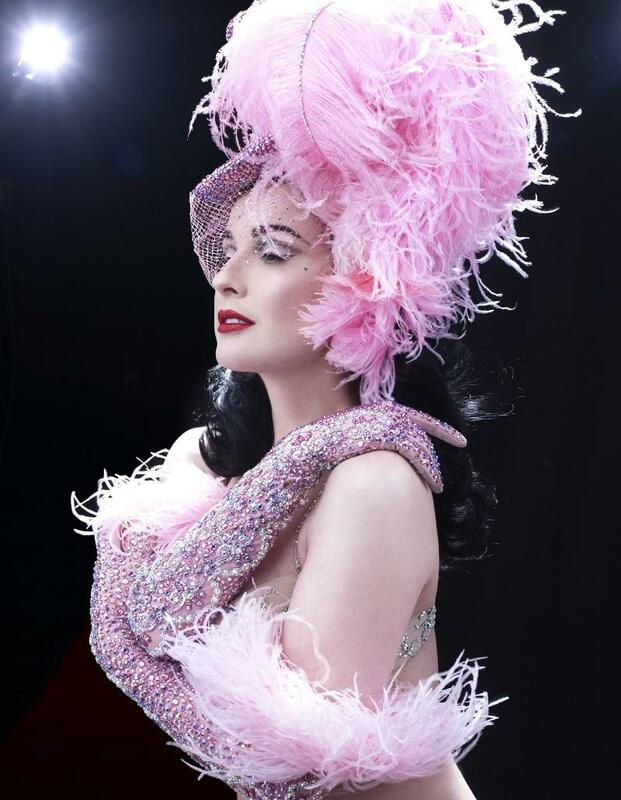 Dita is currently preparing to take her variety show “Burlesque: Strip Strip Hooray!” on a nationwide tour in 2012! ~ by angrytruffle on 02/29/2012.